software is an essential tool for audio technicians, police officers, forensic technicians, countermeasures technicians, and other audio related fields. The program provides the user a audio spectrum analyzer that is powerful and simple to use without complicated menus and setup requirements. If you require a complicated engineering program that costs hundreds - thousands of dollars, this is not the program for you. 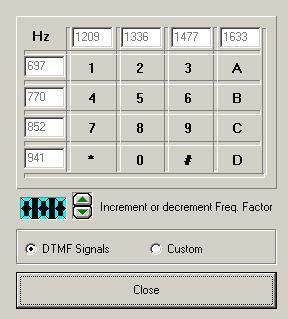 The features of the software include a 2048 FFT Spectrum Analyzer, a WAV recorder / player with built in looping, a sine wave and white noise generator, a simple oscilloscope, and a DTMF decoder for decoding recorded DTMF tones from WAV files with a 45 character display window. DTMF decoding in real time from WAV files or high speed DTMF decoding from the file (faster than real time). The software uses the built in microphone / line / aux / CD inputs from your internal or external sound card. The analyzer provides the capability to store and recall audio spectrums, print spectrums, applying gain to the signal, and load saved spectrums behind active inputs. Other features include peak frequency display, spectrum hold and freeze, cursor identification of measured frequency and decibel level, splitting WAV files, normalizing files (automatically adjusting to maximum record levels), converting files to a standard 44.1 sample rate, converting MP3 files to WAV files, level indicators beside the analyzer and in the WAV player, adjusting color schemes, saving your favorite settings as the default setting, and loading other saved setting of choice. The software features a standard WAV player with built in loop function, display of file name, sample rate, bit resolution, elapsed time, remaining time, level indicator, play, record, pause, and a high speed WAV file scan for DTMF tone decoding. The Analyzer section gives the user control of spectrum update / decay rate, frequency bandwidth, gain, freezing a spectrum, automatically reading the peak frequency, holding the peaks, and spectrum grid. 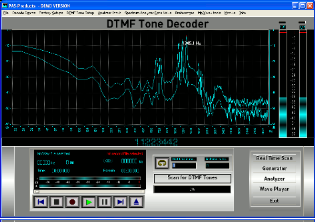 The DTMF decoder section has an adjustable frequency matrix providing the user with a means to decode off frequency audio files due to incorrect record or playback speeds from analog recorders.The Generator function provides the user with some simple test features for setting record levels, evaluating equipment, and viewing audio in the time domain. 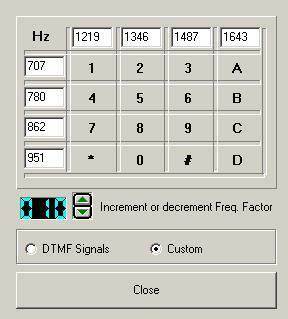 The DTMF decoder section has an adjustable frequency matrix providing the user with a means to decode off frequency audio files due to incorrect record or playback speeds from analog recorders. The Generator function provides the user with some simple test features for setting record levels, evaluating equipment, and viewing audio in the time domain. The spectrum display provides the user with important information about the audio under test. 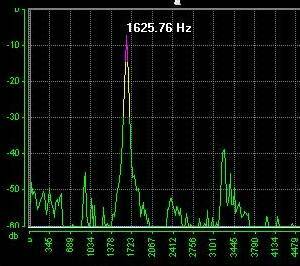 In the example shown, a tone at 1625 Hz.